David Greetham is Vice President of eDiscovery Sales and Operations at Ricoh Legal in the US. I caught up with him at Relativity Fest in London and asked him about Ricoh’s plans for discovery and related subjects beyond North America. David Greetham said that he was over to open Ricoh’s first London Azure data centre and to help Ricoh’s London team to begin operations. Part of the perceived need for a London data centre was the growing concern about the General Data Protection Regulation (GDPR). Beyond that, the primary purpose for opening a London data centre is to service the needs of Ricoh’s North American clients, with the intention of later expanding London-based business. Ricoh’s business strategy is to offer ediscovery services and Relativity hosting in the major business centres around the world. This is for more than just eDiscovery or information management – clients are looking for new and better ways of managing ever-increasing volumes of data. Ricoh has embraced Relativity’s Active Learning. It was used in a case with extremely successful results and Ricoh had just published a case study about the matter. There is a larger version of the case study here. Relativity has written about the case here. Ricoh has a consulting role as well as the provision of infrastructure and hosting, providing hands-on help to those who need it. Ricoh explains benefits, runs sampling to gauge relevance and gives the client whatever help it needs to get the job done. Ricoh is happy simply to provide the infrastructure for those who know what they are doing. 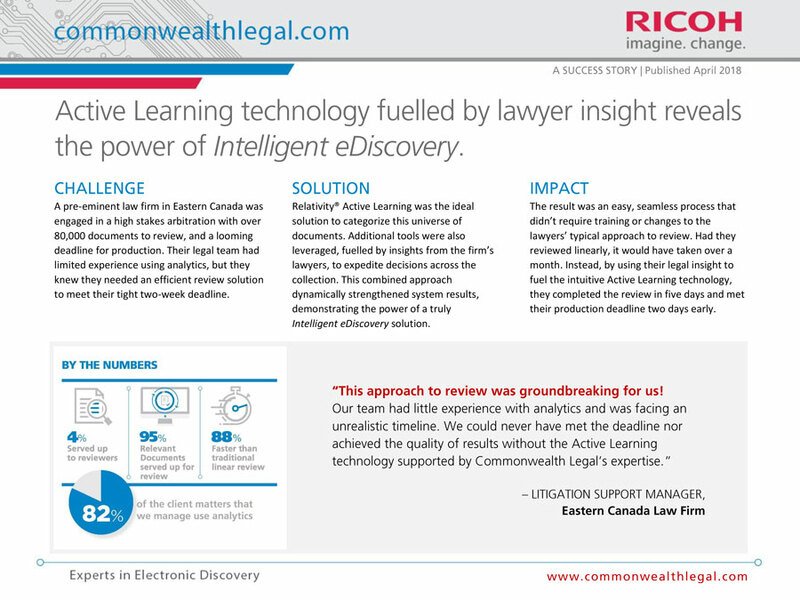 The lawyers want to use new technology, including continuous active learning and artificial intelligence, and a high proportion of those who use Ricoh’s consulting services make use of advanced technology as part of their process. David Greetham says that lawyers coming out of US law schools are now educated in the management of data; they know the Federal Rules and the international rules of discovery and many are working full time in a litigation environment. Ricoh plays its own part in helping to educate lawyers. Although Ricoh still does much of its work for law firms, much now comes directly from corporations, many of whom have advanced knowledge and a wish to do more for themselves. This is this is increasingly true in the UK as well, although not to quite the same extent as in the US. This entry was posted in Analytics, Artificial Intelligence, Commonwealth Legal, Discovery, eDisclosure, eDiscovery, Electronic disclosure, Relativity, Ricoh, Ricoh USA, Technology Assisted Review and tagged David Greetham. Bookmark the permalink.